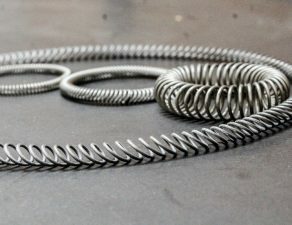 Clifford Spring Company was faced with the task of creating an energy absorbing spring for the oil and gas industry that was non corrosive, chemical resistant with high and low temperature resistance. Clifford Spring Company selected VICTREX PEEK polymer to develop the springs to reduce wear and damage. VICTREX PEEK polymer, the high-performance polymer manufactured by Victrex plc, with its unique combination of high and low temperature resistance, inherent strength, and chemical resistance, has become the material of choice for the manufacture of seal and backup rings in the oil and gas industry. Read more about the exceptional qualities of Victrex PEEK Polymer properties. However, the weakness of seals has always been the necessary addition of the metallic energy absorber, which in extreme circumstances, if the seal wears, can come in contact with and irreparably damage the shaft. The Clifford Spring Company based in Redditch in the UK, with over 40 years experience in manufacturing energizing springs for this sector, has developed a solution to this challenging problem, producing energy-absorbing springs using VICTREX PEEK polymer. An additional benefit of using VICTREX PEEK polymer in this application is that the overall weight of the seals is reduced due to the elimination of metallic components, and there are no issues with differing rates of thermal expansion as both the seal and the energy absorber have the same co-efficient of thermal expansion. The energy absorber spring made with VICTREX PEEK polymer can be manufactured as a totally encapsulated item, or as a Garter type spring where the spring made with VICTREX PEEK polymer can be added to the seal as a secondary operation, following molding or machining of the seal. The energy absorbers are produced from VICTREX PEEK monofilament extruded by Zyex Ltd of Stonehouse in the UK, a facility that is capable of spinning VICTREX PEEK filaments from over 2mm down to 10 microns in diameter. Zyex has more than 20 years experience in producing such monofilaments, multi-filaments and staple fibres. Their exacting standards mean that VICTREX PEEK can also be woven into extremely fine meshes and used as filters in chemically aggressive hot environments and braided into cable harnesses to give protection from abrasion in demanding oil and gas and aerospace applications. The total encapsulation method carried out by the seal manufacturer prevents the seal lipping out and therefore prolongs the life of the seal. A further advantage of having a thermoplastic spring in the Garter type of seal is that the monofilaments can be produced in virtually any color in the spectrum, allowing instant identification ensuring the correct energy absorber has been fitted to the seal. The energy absorbers made with VICTREX PEEK polymer are available with an outside body diameter of 1.40mm up to 10.00mm. 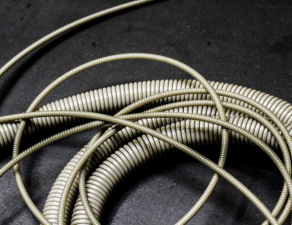 The maximum single length that can be produced is 2.4M, this equates to a spring diameter of approximately 750 mm. 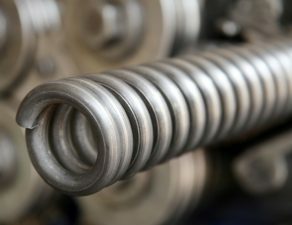 multiple springs can be joined end to end to give a larger spring diameter. Festive greetings from Clifford Springs!